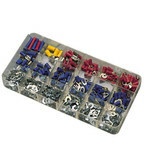 Simplifies the removal of smaller bearing gears and pulleys on electric motors, alternators etc as well as tight fitting vehicle battery terminals. 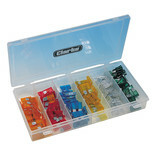 An assortment of 120 popular standard blade, automotive fuses in a translucent, 6 compartment storage box. 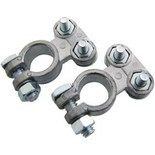 2 pack of battery terminal clamps, positive and negative clamps provided. 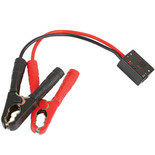 Will fit standard battery posts. 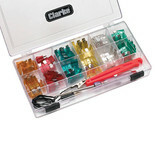 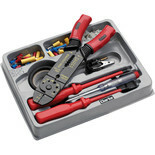 This automotive electrical tool kit includes a steel crimping tool, 2 x insulated screwdrivers, 12V/ 6V electrical tester, reel of insulating tape and assorted crimp terminals. 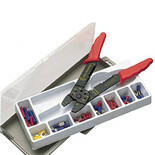 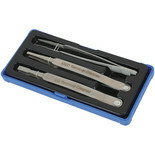 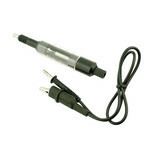 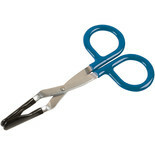 The Laser bulb pliers are designed to remove miniature style bulbs on cars, boats and planes. 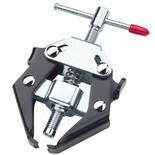 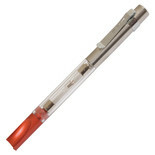 This unit is also suitable for bayonet, screw and wedge design and dipped handles for secure and safe use. 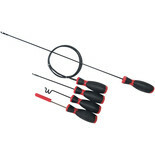 This 5 piece wire threading set includes 3 pieces of threadding wire, 1 piece for inserting wire through grommeted holes and 1 piece for pulling a group of wires through a vacant loom. 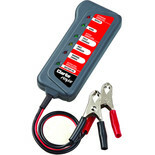 2L Battery fluid top-up container. 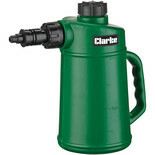 Push release valve in spout prevents spillage.